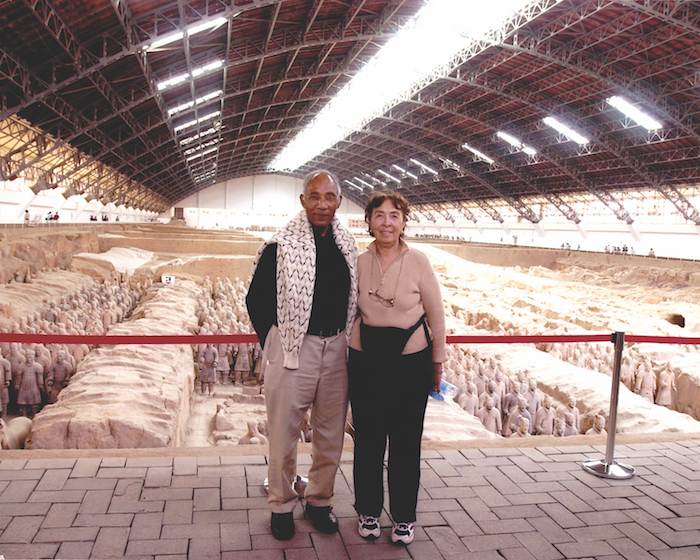 OWEN AND REATHA SMITH view the terracotta warriors in Shaanxi province, China. Greater Wilshire Neighborhood Council (GWNC) President and Brookside resident Owen Smith and his wife, Reatha, have seen the world. Over the past decades, they visited Russia, Norway, Sweden, Denmark, Thailand, Hong Kong, China, Japan, South America, Hungary, France, Canada, Egypt, Kenya, South Africa, Greece, the Falkland Islands, Germany, Austria, Italy… I could go on, but I would run out of space. How did they get to visit so many exotic places? Cruise ships, both large and small. The Smiths were introduced to cruising through their friend Jim Wolf, chairman of the Park Mile Design Review Board, vice president of the GWNC, and immediate past president of the Hancock Park Home Owners Association. When Owen and Reatha’s children were younger, the Smiths would take the family on cruises to destinations such as Hawaii, but then would send the young ones home and continue on to more distant destinations such as Japan. They’ve embarked on about 40 different large and small ocean and river cruise ships, including Tauck, Viking, Renaissance, Holland America, Norwegian and Crystal cruise lines. Their current favorite is Crystal Cruises. When Owen and Reatha were younger, they enjoyed many of the smaller cruise lines, but now that they are older, they find that the larger cruise ships serve their needs better. One of Owen’s favorite memories is of a visit to Prague in the Czech Republic. Since Owen and Reatha have been cruising for so long, they’ve also been able to experience the changing political winds of the United States as viewed by residents of foreign countries. Owen and Reatha have used their time cruising to see everything from the world’s most famous waterfalls to the glaciers of Lake Louise to the Yangtze River, and they even viewed Falkland Island penguins in their natural habitat. Does Owen have any regrets about his vast travels? After exploring so much of the planet, where will Owen and Reatha go next?